Referring to the last posting, it was obvious that things were not going as well as they might. However in the sport of climbing, perseverance is everything, a point I constantly lose sight of. So it was back to the mountain last night. Things were a bit warmer but still cool and I got on the traverse at Nook's again. Amazingly the part that I flashed last summer proved resistant still but I sussed out a new sequence and another try got me through the first 2/3 to the hueco--only the technical and very thin finish was left. Even with a good stance at the hueco, the insecure nature of the exit makes it difficult to guarantee success. Luckily I finished. It's a hard problem to grade but V10 seems appropriate. The section to the rest is given V9 and the end is no cakewalk. Certainly one of the best traverses on the mountain. On a related note, I climbed the traverse in a pair of Carhartt jeans I picked up a while ago. Normally I never climb in jeans since they are typically too heavy and confining. However, I am looking for new climbing wear and am having trouble locating something that isn't a. ridiculously expensive, b. designed for someone considerably more interested than I am in zippers and cargo pockets, c. not made of creepy feeling "miracle" fabric that can recharge your iPod (also see item a), and d. can be worn on the street without feeling a wee bit self conscious. I have found only a few examples over the years that match the criteria. 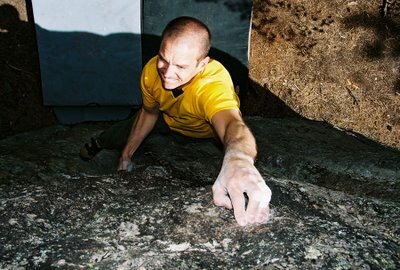 Franklin Climbing had a great line of climbing clothing that was simple rugged and moved well. They went out of business. A while ago, Prana actually made men's pants that weren't too fruity but that has gone by the board. Gramicci takes the crotch gusset thing a bit far and the lower leg and cuffs are maybe too narrow. Most of the other makers are just too trendy/fruity for my taste. So if anyone has suggestions for solving this admittedly minor dilemma, I welcome your responses. The price threshold is Carhartt's 35 to 40 dollars a pair. two words: mountain. khakis. mild crotch gusset, tough as hell, etc. the mountain jean, in particular, is rockin. i'm wearing 'em right now. i just continue to patch my old prana stuff. sure, i look like i'm headin' for phish tour, but all i have to do is show em my chalk belt belt and - blam! - i am properly legible. as far as new stuff? : i just wear sweatpants under jeans. it's warm, i look good on the street, and i look like a homeless person at the boulders. triple win. Peter- really solid send! 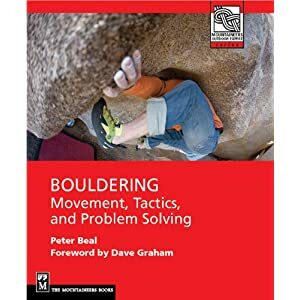 Nook's is my favorite area right now and I appreciate the chalk, not to mention all the other beta and stoke your site provides local boulderers. First off, nothing will beat the Carhartts for durability. That being said, I usually climb in scrubs. I found some for 3.99 awhile ago online, which is a hell of a deal. I don't know how you feel about tooling around town in scrubs, but I dont mind it a bit. My second choice in legwear is just cheap jeans from the local store. Wal-Mart, Target, TJ-Max, where ever. $15 bucks should get a decent pair of jeans. They won't last as long as the Carhatt's but usually hold me through a tough season. I have begun the almost neverending process of patching my prAnas. never liked climbing in jeans. I have a Prana pants that have held up well. They could probably pass for khakis around town and have been indestructible. If they go, I'd definitely try to find another pair from Prana. Quick session at Flag: How did Winter Get Here?